Riding on Cummins' four for 10 figures, Australia reduced India to 54 for five in the second innings of the ongoing third Test but still trail the visitors by 346 runs. Pat Cummins is clapped off after his four wickets during day three of the Third Test. Pujara and Kohli had put on 170 runs in the first innings to help India declare at a mammoth 443 for seven and Cummins said the Australian batsmen need to take a cue from the visiting duo's temperament. "It was obviously not ideal. We turned up thinking of a good first innings score and be right in the game. We wanted to take this result away from them. This is a young batting group and they are working hard. They are trying their best, but it is just one of those things. Today it didn't come off," Cummins said after the day's play. "What we saw from India's first innings, we saw temperament of Pujara and Virat and how they pace their innings. They absorb pressure because, on this kind of wicket, it is hard to score runs. "You have to face a lot of balls to get big scores and it is probably one of those wickets where you do the hard work early. Keep absorbing pressure and score later, but evidently, it did not work for us today," he added. 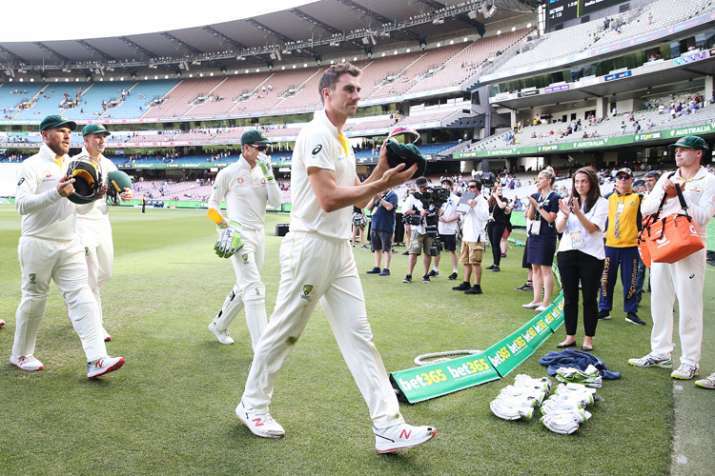 Riding on Cummins' four for 10 figures, Australia reduced India to 54 for five in the second innings of the ongoing third Test but still trail the visitors by 346 runs after conceding a first innings lead of 292 runs. The fast bowler said in the absence of their two best batsmen -- the banned duo of Steve Smith and David Warner, others have to rise to the occasion to give India a tough fight in the remaining two days of the match. "It's always going to be hard missing two of your best players. We've known for nine months (that Steve Smith and David Warner won't be available). Others have to stand up. It probably highlights the class they've had in previous years but we've got find to find a way," Cummins said. "Everyone here is good enough. They've done it at the level below, all of them are the best (Sheffield) Shield players and most of them have done it for Australia before. Wicket feels pretty good still, so everyone feels like in the second innings they can face more balls and get going," he added. Cummins was the wrecker-in-chief In India's second innings with his impressive figures. "I am pretty tired, exhausted but the good thing is that coming into this series I felt really fresh. Hopefully, there won't be too many overs tomorrow and we won't have to bowl last in this game. So hopefully there will be a 4-5 day break before Sydney," Cummins said. "If we knock them over in the morning, you just never know. We tried to make it very hard for every run. The wicket is still pretty good, tough to score runs. But we saw last year we batted really well on day four and five (at the MCG), you dare to dream. "But it's still a long way left in the game. For India to move the game forward will be hard tomorrow. They will have to bat long and we will just take it as deep as possible," he signed off.